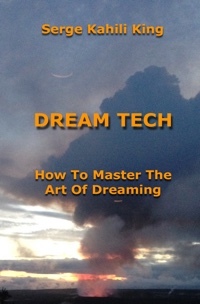 Paperback Dream Tech: How To Master The Art Of Dreaming, by Serge Kahili King, Ph.D.
Serge Kahili King has his doctorate in psychology and is well-known for his many books, videos and articles on Hawaiian culture, shamanism and healing, which include Huna: Ancient Hawaiian Secrets for Modern Living, Urban Shaman, and Instant Healing. He has recorded over 5000 of his own dreams, worked with the dreams of clients at his own hypnotherapy clinic for ten years, has taught about dreams and dreaming in classes and workshops for over 40 years, and has studied the beliefs and practices of dreams and dreaming from many different countries and cultures around the world. The purpose of Dream Tech is to give readers an in-depth understanding of night dreams, day dreams, and the perception of life as a dream, along with techniques and practices for developing one's skills in each of these areas. The first ten chapters deal with night dreams and the next two are about what Dr. King calls the "In-Between State." These are followed by three chapters on Day Dreams and five chapters on Life As A Dream. The last chapter is about how to put all this together in Lucid Living.